Fred Levine and Little Hard Hats present the first edition of the BIG MACHINES series. 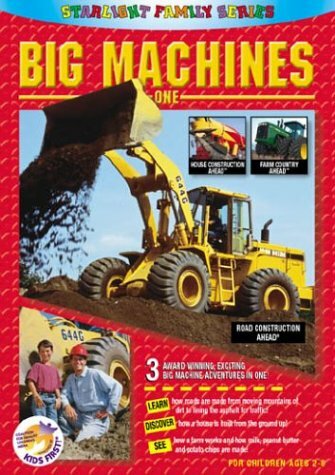 Big Machines 1 teaches children about the construction of roads, highways, and houses. Also included is a segment on the inner workings of a farm. The three-part volume features the titles "Road Construction Ahead," "House Construction Ahead," and "Farm Country Ahead". Road Construction Ahead: Go behind the wheel as we bulldoze, haul dirt, blast rock and finally build roads. House Construction Ahead: Put on your hard hat and come along for rock blasting and harvesting timber, to pouring the foundation of a new house. Farm Country Ahead: Go behind the scenes to see milk, peanut butter, bread and potato chips being made on an exciting trip to farm country in "Farm Country Ahead".